In collaboration with the designers Oddvin Rykken, Svein Gusrud and Peter Opsvik, Norwegian born Hans Christian Mengschoel created the first “Balans” chair in 1970. The idea was to design a chair which would allow users to sit in a kneeling posture, thus relieving the pelvis as well as the spinal column. Display model. Design, Hans Christian Mengshoel.Working chair in massive beech and upholstered seat in fabric or leather. 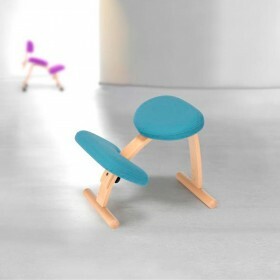 The human body is not built for static sitting, and so balans chairs are designed to stimulate movement and variation .